First off, what is gain staging and why is it important? Gain staging is the process of managing the levels of incoming audio signals to eliminate noise and prevent distortions or signal clipping as much as possible. How do I address gain staging in my recordings? Historically, in the days of analog recording, engineers would try to find a “sweet spot” at which the incoming audio signal was significantly above the ordinary analog noise floor but yet would fall just shy of clipping the audio signal during the loudest parts of the performance. This spot was often around the 0 db zone. This would result in tracks that were as hot as possible without clipping. However, with the advent of digital recording, the recording noise floor has dropped to next to nothing – and the gain stage needed to change with it, too. Digital recording not only allows for, but basically requires, a far more conservative approach to recording levels. This technique creates good-quality recordings with, by default, low background noise, and plenty of headroom on the meter. Often, plugins used during the mixing and mastering phases of recording will use some of that headroom, so if your initial performance was done at too high a level, the addition of plugins can easily push your performance into the dreaded “too hot” zone. The quality of your sound will suffer. Far better to record at a conservative level and make a track louder, if necessary, during the mastering stage than to have to over-compress and squash the life out of a good performance that was recorded at too high a level. For digital recording, the “sweet spot” tends to be around -18 dB. Proper gain staging also helps in the mixing phase of recording – in general, mixes turn out better when tracks are at low levels on the faders. 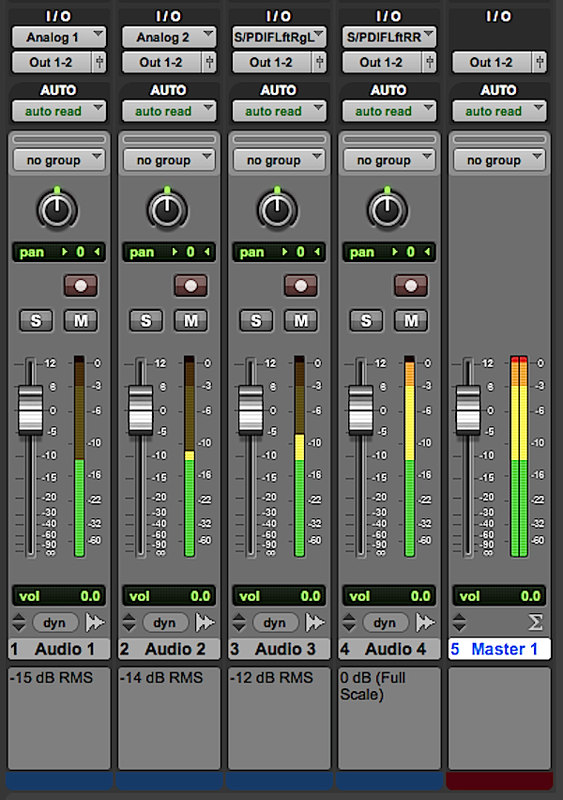 If a mix is too quiet for you to adequately hear it, don’t turn up the faders on the board – turn up your monitors! After recording, mixing, and ensuring that no signal-clipping has occurred in any track, bus all channels through a stereo master fader. This fader represents an aggregate of all signals being bussed to it from other channels, so it may very well be the case that it will have a very high signal, or may even clip. If this is the case, group all audio channels and turn them down as a collective unit until the master fader is at about -10 db. It should not be approaching the -3 db mark – don’t just turn down the master fader! This only masks the symptom of the issue without resolving the issue itself. I hope this helps with your next mix. Good luck! Should I bother with acoustic treatment? We here at Wolf’s Den Studios are back from a brief hiatus out to Las Vegas. My short answer? Yes, otherwise I would not have just spent two weekends taking care of exactly that! To answer this question properly – that is, my long answer – let me first discuss what acoustic treatment is, what it is not, and what conditions it works best under. Let’s start with what acoustic treatment is not. Acoustic treatment is NOT soundproofing. Acoustic treatment will not stop sound from leaking into your studio. Acoustic treatment will not stop sound from escaping your studio. The only way to “soundproof” your studio is the same way big pro studios do it: Floating floors, floating ceilings, and multi-layer walls. Unless money is no object – and less face it, money is definitely a object for most of us – these sorts of structural changes are just not feasible for a home recording setup. But just because you are not in a big pro studio does not mean you can’t achieve a big pro sound – and that is where acoustic treatment comes in. So what is acoustic treatment, anyway? Acoustic treatment is something that will reduce audio reflections. Acoustic treatment will reduce reflections in your instrument recording environment. 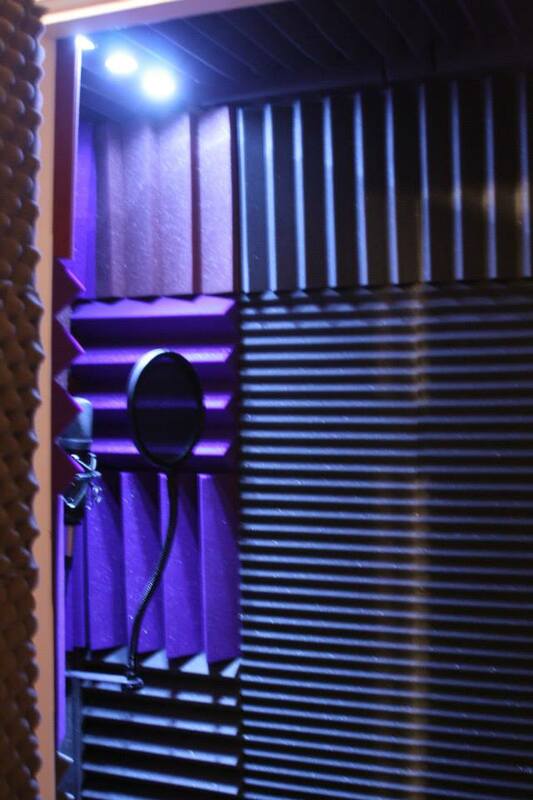 Acoustic treatment will reduce reflections in a vocal booth. Acoustic treatment will reduce reflections that affect your mixing room sound (and therefore your mixing decisions). These audio reflections create uncontrolled reverb: undesirable echoes that can make a recording sound tinny, dull, or muddy. Getting rid of uncontrolled reverb is a key component of recording a clean, rich tone. The point of acoustic treatment is absorption and diffusion of sound waves. Hard, flat surfaces, like walls, ceilings, and floors, will reflect almost all sound waves back into the air space of the room, where they will be recorded by an active microphone. By breaking up and softening these surfaces, sound waves can be “soaked up” to prevent their continued reverberation around the studio. What can be used as acoustic treatment? Here at Wolf’s Den Studios, our preference is for Auralex acoustic foam. This is sold in tiles or sheets, and can be found for reasonable prices online. It is a high-density, fire-resistant foam, with the fronts sculpted in triangle or wave shapes to eliminate flat surfaces. It comes in thicknesses ranging from half an inch to over 3 inches thick. The thicker the layer of foam, the better its properties for sound absorption, particularly of low frequency, bass-y tones. Auralex can, however, get pricey: even a small room, when treating 4 walls, a ceiling, and a door, can add up to a surprising amount of square footage that needs to be purchased. Some may opt for using egg-crate foam, of the kind that is commonly used on beds. While this is better than nothing – marginally – bedding foam often is not dense enough or thick enough to provide adequate absorption and diffusion of sound, so it wouldn’t be our first recommendation. Very heavy drapes such as those used in theatres or the light and sound blocking drapes used in high end hotels can be an option, if you are fortunate enough to be able to acquire these cheaply at an estate sale or auction. If appearance is not important to you old mattresses will also be effective. What should I treat, and where? This depends on the function of your studio space. For recording vocals, a room that has 100% acoustic treatment coverage is best – which is one reason why vocal booths are often so small! For recording instruments depending on your room you can start with about 50% coverage. For mixing and mastering, a good place to start is treating the surfaces immediately to the left and right as well as behind your studio monitors. I would also recommend treating the ceiling above your listening position. One method to determine acoustic treatment placement in your mix room is to use a hand held mirror held at the level of your studio monitors and place foam anywhere you can see a direct reflection of your monitors. More may be necessary but this is a good place to start. But does it really make a difference? I’ll let you decide for yourself. Here is a recording in our vocal booth prior to giving it acoustic treatment. And here’s a sample of a vocal recorded after treating the vocal booth with 100% coverage of Auralex. No effects have been added to these samples. The difference you hear is solely the result of acoustic treatment. Is acoustic treatment the magic bullet that will instantly solve any problem in the studio? No – but proper acoustic treatment is a critical step in achieving a pro studio sound. With proper acoustic treatment, you are one step closer to getting a clean, professional sound in a home studio environment. Musicians, Engineers and Music Fans. Here is where You can enter the Wolf’s Den and become one of the pack by following our music blog. We will be giving regular tips & advice on playing, recording, mixing, mastering, getting your music heard & finding music from other talented artists. We will post reviews on equipment and software and our experiences with them. We will also talk about instruments (vintage and new) Whats going on with artists we love and anything else in the world of Music. We hope you’ll find this blog educational and fun!